A must have for any Disney Cars fanatic! This brightly coloured interactive obstacle course is for hire for your next event and suits children aged 4-12 years old. It has plenty of tunnels, slides and obstacles to tackle inside and then climb the final hill to finish with a speedy slide exit! 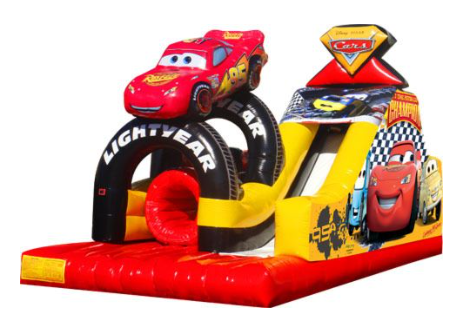 Kids and guests will love this ride as Lightning McQueen sits perched above watching over you all. This inflatable obstacle course and slide is great for team sports presentation days, school fundraiser’s and anywhere you need a fast action packed fun challenge to keep the kids occupied in high numbers. $800 for 4 hours and $110 for each additional hour - includes a Jumpabout supervisor.